The Ordnance Order of Samuel Sharpe is a very prestigious award for any Officer or NCO serving in the Army Ordnance Corps. I was very fortunate to have the honor of recommending several people for this award during my military career. The award itself has been around since the mid 1990s. It was designed to recognize individuals for their service to the Ordnance Corps. Samuel Sharpe lived during the 1600s right here in America. He was part of a 13 member council that assisted the governor and deputy governor in overseeing the Massachusetts colonies. In 1629 he was appointed “Master of the Ordnance,” and was responsible for the powder, ammunition, fireworks, etc. for the colonies. In essence, he was the first Master Gunner in the United States. The criteria is a little bit vague. In other words, there isn’t a rank requirement I can find. Typically, I’ve found that the award is normally reserved for E-6s and higher and Captains and higher. But I’ve also known experienced E-5s who received the award and some senior Lieutenants who also had enlisted experience, who received the award. As long as you have a good amount of experience in the Ordnance Corps (probably five years or more) you are eligible for the nomination. Ultimately, it’s up to your O-6 (or the Association) to approve your nomination. Who is the Approving Authority? The approving authority is the first O-6 Ordnance Officer in the Chain of Command, or a General Officer. If there isn’t an Ordnance Officer in the chain of command, the form is sent to the Ordnance Corps Association to be forwarded to the Ordnance Chief. As a Small Unit Leader in a Logistics Unit, you should educate yourself about this award. If you have squared officers and NCOs working for you who serve in the Ordnance Corps, you might want to consider submitting them for this award. This is great for morale and esprit de corps in your unit. And your subordinates will appreciate that you took the time to do it. All you have to do is fill out a nomination form and get your chain of command to approve it. In summary, the Ordnance Order of Samuel Sharpe is a great award for Ordnance Officers and NCOs. It’s designed to recognize soldiers for their time honored commitment to the Ordnance Corps. It’s dedicated to Samuel Sharpe, who was an important and patriotic man during the 1600s. Very few people know about the award. If you are an Ordnance Soldier, or have Ordnance Soldiers working for you, you should educate yourself about this award and use it to recognize your good soldiers. On a side note, if you have been on the receiving or giving end of this award, I would love to hear your story. 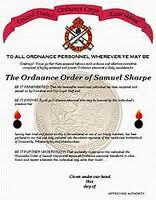 Please tell us about your experience with the Ordnance Order of Samuel Sharpe. Also, if you have any questions about this award, you can post them below. Question is can a Soldiers receive a second award Samuel Sharpe? In the event the person putting the Solder in did not know he or she has one already? I will check into that and will respond as soon as I find out. My questions is, I was not aware of this award while serving in the military. Is it possible to receive this award post military? Or is it possible to receive this award as a civilian still serving in the Ordinance Corps capacitiy? I must admit, I am not sure, but I will do some checking. Isn't another requirement is to have a one page write up for this award? If so do you have an example letter? I haven’t done one of these awards in quite some time. I no longer have the write up. If I remember right, it as on a separate piece of paper. Maybe someone else can chime in here. I am very sorry to hear that Patrick. It does sound like you deserve the recognition, but do not let that hold you back. Keep striving forward and great things will come your way. My honey just got this award…so proud of him! Yes your maintenance soldiers can recieve the award to include your PC’s that work within the maintenance fields or FMS/CSMS’s. The really is no rank requirement but I have always been under my own personnel rules and that is, are they always preaching good maintenance, do they understand it and not just talk it and do they go above and beyond the position they are in to ensure full mission success. For those who have recieved it I am sure they were proud and rightfully so, but we don’t want the award to lose it’s meaning because it is given out to freely. There is plenty of time in a young soldiers career to recieve the award but if they are constantly going above and beyond then fell free but while you are at it you may as well promote them if they are doing so well. Good points, Chief. Thanks for the comment. Thanks for explaining what the Ordnance Order of Samuel Sharpe Award is. It’s cool to have a prestigious award that honors a true Patriot who helping ensure freedom before our country even declared independence. Anyone who gets the Ordnance Order of Samuel Sharpe must be very proud. Recognizing soldiers who do a little bit extra can pay off immensely with morale. Yes, the Ordnance Order of Samuel Sharpe is a great award. I’ve presented it to a few Soldiers myself and they really appreciated it. Imagine, being part of something so powerful and meaningful that you have an award commissioned after you. That my friend, is an accomplishment. While I don’t quite know the ranks of the military quite well, being the first Master Gunner of the United States has a pretty ring to it. It seems that Samuel Sharpe is a man that most of us have forgotten in history, but the army is keeping his memory alive. Samuel Sharpe did some great things during his life. The Army has done a great job honoring him and remembering his contribution to our country. The Ordnance Order of Samuel Sharpe is indeed a fine award. I’ve awarded it to several soldiers and they were always very proud of it. I’m embarrassed to admit I didn’t know who Samuel Sharpe was before reading this post. First Master Gunner in the US – that’s quite a place in history! Thanks for writing about this prestigious award, which any officer or NCO would be honored to receive. It’s strange that the eligibility criteria are so vague. But “integrity, moral character and professional competence” sums up the characteristics of a good soldier, along with “selfless contributions to the Corps” – definitely worthy of an award. The eligibility for the Ordnance Order of Samuel Sharpe Award is a bit vague. I think they do that to leave it at the discretion of the person putting them in for the award, which is a good thing in my opinion. And to reply to your comment, Samuel Sharpe was the first Master Gunner in the United States. He has a very important role in military history and should never be forgotten. Thank you for this thoughtful post. I was unaware of any such specialty awards as these though they make good sense. I was in the medical field and don’t know of an award such as the one you mentioned, though I was invited to participate in the AMEDD Best Medic competitions which serve the same purpose. Both unit and individual morale are what keeps a unit functioning and should never be overlooked..
Every branch as a similar award to the Ordnance Order of Samuel Sharpe. I agree with you that awards and competitions are a great way to raise the bar and bring out the best in your Soldiers. If you supervise others, you should take the time to educate about what your/their branch has to offer so you can put them in for a specialty award if they are deserving. Most branches within the Army have some form of recognition like this available over and above the awards for which all soldiers are eligible. The post is absolutely right–most people don’t know about them. The cavalry has the Order of St. George, and the infantry has the Order of St. Maurice, which I was honored to receive last year. It’s a little ironic–I spent well over a decade in an infantry battalion and never heard of the Order of St. Maurice but was awarded it my second year in a cavalry squadron. Like any other award they shouldn’t just be handed out willy-nilly, but for people who deserve a little extra recognition, they’re great, and they mean even more because they’re specific to the awardee’s career specialty. Congratulations, Daniel. I’m sure you did a great job to get awarded the Order of St. Maurice. Keep up the good work!